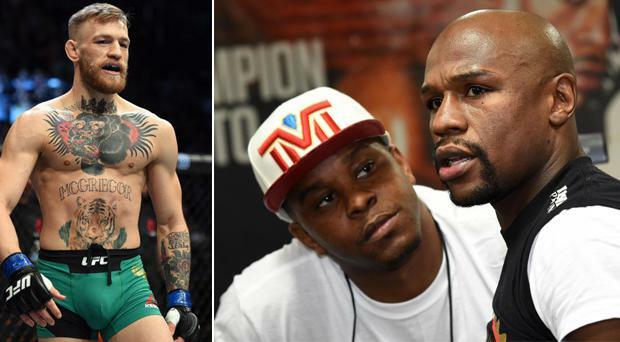 Floyd Mayweather’s camp aren’t paying too much attention to ‘leaked’ sparring footage that shows Conor McGregor struggling in the ring with mid-tier boxer Chris van Heerden, claiming that the footage could be part of an elaborate ploy. Less than 24 hours after the Mayweather vs McGregor boxing match was confirmed, Van Heerden leaked footage of him sparring with McGregor in 2016. The video quickly went viral and shows Van Heerden – a former IBO welterweight champion with a professional record of 25-2-1 – comfortably getting the better of McGregor. “People are tweeting and talking and telling me that Mayweather has his hands full landing on Conor McGregor,” Van Heerden said upon releasing the video. “I’m a professional fighter — a boxer. And I’m standing up for the sport. I was just making it very clear that, don’t be ridiculous. But Nate Jones, assistant trainer to Mayweather, has expressed his doubts that the footage is legitimate, instead claiming that it could have been staged to lull Mayweather into a false sense of security. “I think I’ve seen that sparring. First of all, like I said, I looked at it, but to me it looked (like) it’s a possibility it could be staged,” Jones told Submission Radio. “We don’t fall for that, we prepare for anything. Please believe me, I looked at it and I came up with my opinion that it could have been for real but it could have been staged. I don’t know. Jones also reassured fans of the undefeated Mayweather that the 40-year-old was training “like never before” for his fight against boxing novice McGregor. Mayweather boasts a flawless professional record of 49-0 and has only been knocked to the canvas once before in his career, while McGregor will be making his debut on August 26. But Jones insisted that there was no danger of his man succumbing to complacency. “I looked it and after a while I watched the whole entirety of it, but I know that it could be staged and that don’t mean anything,” he added. “We’re not gonna take that lightly. That don’t mean nothing to us. I looked at it, but it don’t mean anything. “We’re gonna train like never before. I don’t think Floyd looked at it cause he don’t do that. We’re not worried about that, we don’t worry about that. When you look bad, it don’t matter to us because they could be staged.